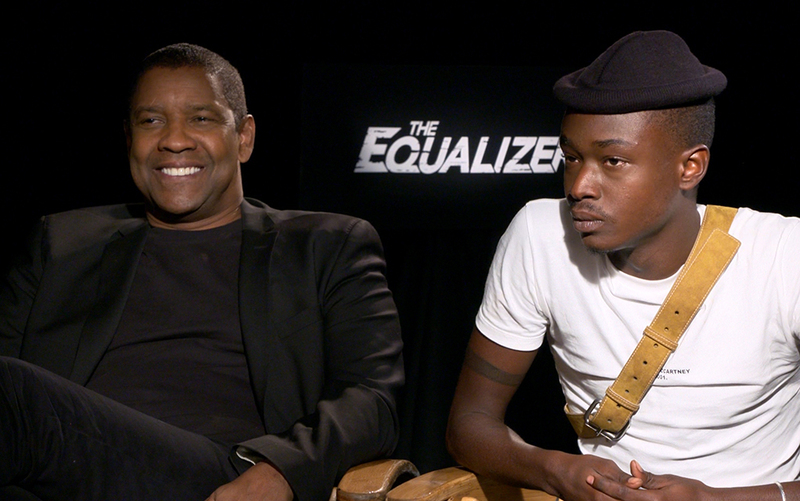 Denzel Washington and Ashton Sanders on the Father-Son Dynamic of ?Equalizer 2? Home Lifestyle Arts & Entertainment Denzel Washington and Ashton Sanders on the Father-Son Dynamic of ?Equalizer 2? Sitting in a Four Seasons suite on a recent morning, Denzel Washington and Ashton Sanders are giving off a distinct father-son vibe. Washington, a veteran actor 40 years Sanders? senior, is holding the ?Moonlight? star accountable for his goals like only a parental figure and mentor can. ?You just said, ?I want to be just like you,? right?? Washington said. ?Yes,? said Sanders, his face dropping like a toddler in timeout. ?And then you said, ?I will ? .?? Sanders frustratedly interrupted him: ?I?ve (already) started doing it. Damn.? ?What, you mean you made $10 million? Why didn?t you make 20?? he joked. The two stars of ?The Equalizer 2? look at each other. Washington?s eyes are filled with pride and glee, Sanders? with aplomb and gratitude. It?s like looking in a mirror, at what once was and what can be. ?Equalizer 2? picks up where 2014?s original ? which was loosely based on the 1980s procedural TV series starring Edward Woodward ? left off. Washington?s Robert McCall, an ex-government operative turned avenging angel, is still doling out justice for the exploited and oppressed. Though Antoine Fuqua?s action-crime thriller very much earns its R rating for violence, there?s an unexpectedly emotional through line this time thanks to a relationship McCall builds with a teenage neighbor (Sanders) about to make poor life decisions. When a group of men looking to kill McCall takes the young man hostage, McCall is faced with some tough choices. The film also marks the first time Washington has made a sequel in his 40-year career. ?I don?t know about the word ?sequel.? That doesn?t mean anything to me. That?s a business term,? he said. ?This was just a story and a character that I was still interested in.? The exploration of a surrogate father-son relationship in the script by Richard Wenk (who also wrote the first film) helped. ?The bones were there, and though I hadn?t met Ashton yet, the idea was good,? he said. He noted that their mentor-mentee relationship ?only grew as we got to know each other and (the film) became an extension of our conversations between takes.? ?It was natural for me because I have two sons, and he was like my third son,? Washington continued. ?He asked questions and I?d answer, or try to, about things he wanted to know about the business.? For Sanders, who turned 20 while ?Moonlight? was in production and is now 22, working with Washington and Fuqua was a life goal and influenced his decision to seek the role. ?They are masters at their craft, and I?ve been looking up to Denzel for a minute,? he said. ?I just wanted to be in scene with him and work with and learn from him.? He called the relationship between his character, Miles, and Washington?s McCall ?important.? ?Miles represents a lot of black boys living in similar situations trying to figure themselves out, not really having anybody or a father figure to be there to point you in the right direction,? he said. ?Miles isn?t the worst kid, but he?s engaging in stuff he shouldn?t be, so it?s a story of hope in the hood.? In the film, Washington?s character continues his ongoing task of reading the 100 books everyone should read before they die, a promise he made to himself after the death of his wife, who had almost completed the list. The 98th book on the list is Ta-Nehisi Coates? ?Between the World and Me,? the author?s 2015 work written as a letter to his son about being black in America. It was the perfect book to use in the movie, Washington said, and it?s a detail he made happen after meeting Coates while having dinner with ?Black Panther? director Ryan Coogler. ?Ryan said, ?I want you to meet this young writer, Ta-Nehisi,?? Washington recalled. ?He?s there at the dinner. We start talking. He?s telling me all about his book and life and how he grew up. So I asked him if I could put it in the movie.? Sanders was ?familiar? with the book, though he hadn?t read it. ?I started reading it in between takes, when we would have like 30 minutes of downtime,? he said. ?It was very appropriate to the relationship in the film.? Other books highlighted include Marcel Proust?s ?In Search of Lost Time,? Hermann Hesse?s ?Siddhartha? and Richard Wright?s ?Native Son? ? the last of which was recently adapted into a film by the artist Rashid Johnson and is due for release next year from ?Moonlight? distributor A24 with Sanders in a starring role. When asked what message moviegoers should take from ?Equalizer 2,? Washington said, ?I don?t like to preach. ?People ask me that question and I always say it depends on what they bring to it,? he said. Sanders agreed, noting that his approach to his career involves taking on projects that ?continue to tell authentic stories that people can relate to.? ?I never want to do anything that?s not teaching somebody something,? he said. ?I think it?s our jobs as artists to use our craft to teach.? But something he has learned from this film, in working with Washington up close, is ?more than anything, to trust my artistic spirit, to trust myself.? ?And to keep it simple,? he added, as Washington nodded in agreement. ?I tend to overthink things. I have this perfectionist mentality, and he caught me in that on set. He was, like, ?Yo, chill. It?s not that deep. The mistakes are the best part. You are here to do what you?ve been hired to do.?? Washington interrupted, smiling: ?You?ve got the job already. We?re getting ready to wrap in three days and you?re still auditioning.? The veteran of stage and screen who has won two Oscars and a Tony over the years credited his mother for teaching him to keep it simple. Though he said he had to learn the lesson the hard way. ?But I?m at a place now where I want to share what I know,? Washington said. ?I want to pass it on and see others do well. We should all reach back, and not just when you get to my age. We all have a responsibility. ?